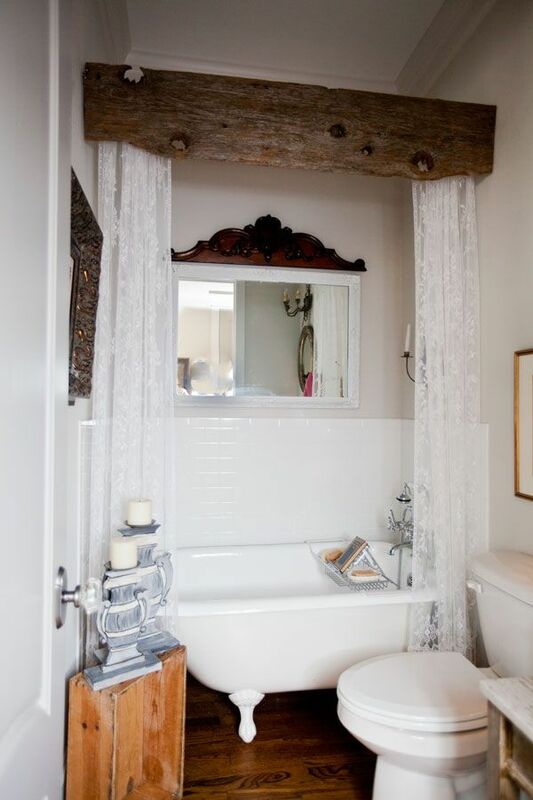 Due to the room getting frequent use, bathrooms get grungy looking quicker than the rest of the house. The small room also costs big bucks to remodel and when those big bucks are not in the budget, use these cheap and easy DIY ideas to update your bathroom and give it an entirely new interior design without undertaking a major home re-modeling project. Start a new color scheme on the floor and work your way up by purchasing a colorful new rug for the bathroom floor. Choose your favorite color in the rug, then purchase a new shower curtain in that color and keep that color scheme going with a new pair of window curtains. Installing a new double-curved shower curtain rod will give you more elbow room inside the shower and an extra rod to hand damp towels out-of-sight. A new coat of wall paint, semi or high-gloss, will make clean-up easy and update the bathroom for just a few bucks. Don’t be afraid to paint the bathroom cabinets as part of the interior design scheme, and add new hardware to the cabinetry. Add a few colorful accessories around the room using other colors pulled from the new rug to give the updated space a unified look. Art work can be placed on bathroom walls, just be aware of the moisture and heat that permeates the air in the bathroom and select art work, like painted ceramic tiles, to use in the interior design. You can get a spa-like experience while conserving water in your current shower with the right showerhead. With a few twists of a pair of pliers or a pipe wrench, you can install a new showerhead for less than 50 bucks. If you’re longing for a rain-shower head, you can get the experience without re-doing water pipes, purchase a rain showerhead that has an extension that fiit right onto your current pipes. Old caulking around the tub and sink looks dingy and dirty even when it’s clean. Remove the old caulk with a scraper and replace it with new, a cheap and easy DIY job that can be done for under $10. Clean dingy grout lines with bleach (if white) or a specially formulated grout cleaner to make it look new again. If the budget permits, invest in some new tiles and create a new vanity top, tub or shower surround. Tiling is a simple DIY projects that instantly transforms any room of the home. Get a new toilet seat and install it yourself. This DIY update is not difficult and for under 20 bucks you will make the most important bathroom fixture look new again. Add new screw caps on the bottom (where applicable) and you’re done with that updating task. Getting all the grooming products organized is a very cheap and easy way to update the look of a bathroom, plus it cuts down on time spent in the bathroom when you don’t have to search for products. Purchase suction cup holders for shower storage, decorative baskets or small bins to store toiletries on and under the vanity. If more storage is needed inside the bathroom, re-paint an old chest of drawers, nightstand or bookshelf to match bathroom décor and place it in the room to hold towels and toiletries. If there is no space for a piece of furniture, install self-adhesive hooks or a clear-pocket shoe bag on the back of the door and use as storage and keep things organized.